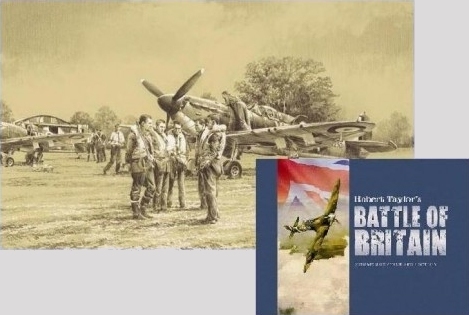 This outstanding new 128-page case-bound book is printed on heavy weight art paper and contains over 150 images, including Roberts most famous Battle of Britain paintings, reproduced in full colour – perfectly illustrating the events of this crucial period of Military History. The magnificent limited edition book is accompanied by a superb luxury embossed slipcase. Each book and print set is also accompanied by its own unique fact sheet on the Battle of Britain. Specially created for this exclusive Commemorative edition, it is full of information on the men and machines who fought during this crucial period of Military History. "WELCOMING RESPITE – THE BATTLE OF BRITAIN, AUGUST 1940"
Issued with the first edition Battle of Britain Commemorative Collection book. 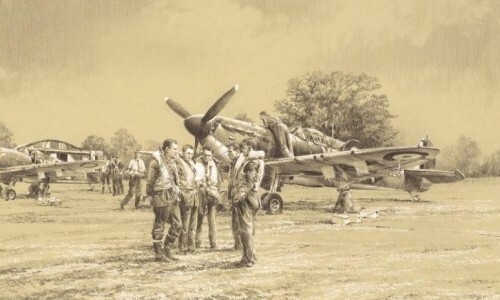 Robert Taylor’s latest masterpiece, beautifully crafted using a subtle combination of delicate graphite skillfully interwoven with subtle hues of the artist’s finest oil paint, rekindles the poignancy of one such moment in this, the most famous of all air battles in history. Overall Print Size: 22" x 18"